3 Bedroom Terraced House For Sale in Sandbach for Asking Price £300,000. Midnight cottage is a picturesque home boasting original features such as exposed beams and an extensive garden. 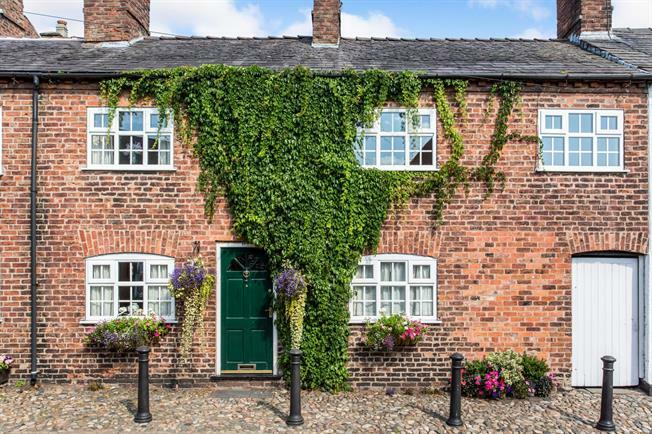 Located in the centre of Sandbach, this beautiful cottage offers easy access to the local shops and convenience for the M6 motorway. This stunning accommodation compromises a spacious kitchen with beautiful belfast sink, two large reception rooms, both containing statement fireplaces, along with a down stairs wc. The first floor landing leads onto three well proportioned bedrooms, family bathroom and ensuite. Externally the property includes a breath taking garden with an extensive range of mature flowers and shrubs. Beautiful fitted kitchen offering tiled floor and window to rear elevation. A range of base and level units, belfast sink and mixer tap incorporated to granite effect worktop. Integral oven and hob with extractor canopy. Integrated washing machine and dishwasher. Double glazed french doors providing access to the rear garden. Inset spot lighting and 2 sky lights. Fully tiled with modern wash hand basin and wc with recessed lighting. Spacious room with windows to front and rear elevation, radiator, beautiful exposed beams, large fireplace and laminate flooring. Spacious room with window to front elevation, radiator, beautiful exposed beams, large fireplace and laminate flooring. Window to rear elevation, radiator and exposed beams. Window to front elevation, radiator, integrated wardrobe and laminate flooring. Two windows to front elevation, radiator, integrated wardrobe, exposed beams and laminate flooring. Window to the rear elevation with a double shower, modern wash hand basin ,wc and heated towel rail. Extensive garden with side gated entrance offering a range of mature flowers and shrubs, patio, shed and outside tap.